1.Combine the rice and water in a saucepan; bring to a boil over moderately high heat. Stir the rice once, reduce the heat to very low and cover with a tight fitting lid. Cook until rice is tender. 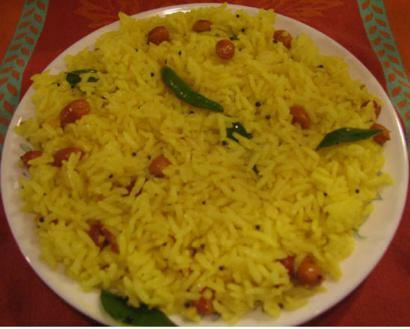 2.Cool the rice in a large mixing bowl or plate. 3.Combine the lemon juice and salt in a cup. Discard the seeds. 4.Heat oil in a pan over moderately high heat. Add the mustard seeds, when they crackle, add chana dal, urad dal and peanuts. Stir fry until golden brown. 5.Add the chilies, curry leaves and asafetida, and sauté for a moment until fragrant. Quickly add the turmeric, stir to mix and immediately add to the rice. Add the lemon juice solution. Mix well.